My journey into the healing arts began as a personal quest for relief from chronic depression and other issues. Early on, in addition to conventional treatments, my doctor encouraged me to explore alternative healing modalities. Curiosity and continuous exploration eventually lead me to meditation, crystals, essential oils, and of course, Reiki. I first encountered Reiki in 2001, while living and teaching in Chiapas, Mexico. It seemed remarkable to me that this mysterious “energy healing” technique, using simple hand placements, could make me feel so good. Nevertheless, more than a decade passed before I was ready to seek out my first Reiki class. Although my motivation was initially for self-healing, the universe apparently had other plans for me. Sharing Reiki and assisting others on their healing journey has become one of the great joys of my life. Embracing an active role in one’s own wellness is not only rewarding, it is incredibly empowering. I invite you to take the first steps towards a happier and healthier you. Some of you may already be familiar with the legend of the Mayan goddess, Ixchel (pronounced EE-shell). Her story is complex, but one of her key roles was as a healer and bringer of water to her people. She is the embodiment of nurturing feminine energy. This is the story of how we met. Often after yoga or meditation I like to pull an oracle card for guidance and contemplation, and in early January I pulled my first card of 2017. I own numerous decks, but this day the Goddess Guidance Oracle Cards by Doreen Virtue stood out. 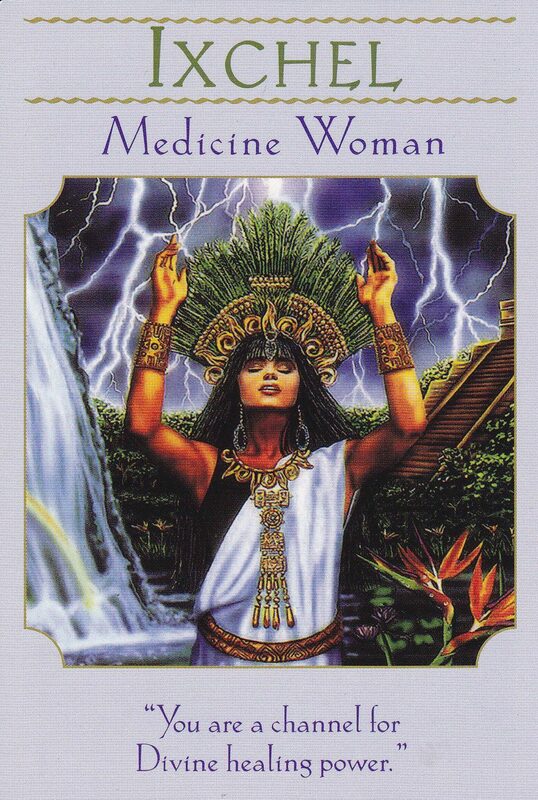 I shuffled while reflecting on the direction my life had taken in the past year, and the card that came up was Ixchel – Medicine Woman. Medicine Woman? I laughed and thought – well yes, of course. Even our names are similar. Incredible! Ixchel was telling me that I was on the right path, and that I should honour my healing knowledge and abilities by sharing and helping others. The cards are always right! During my time in Mexico, I visited several of the sacred sites directly associated with the goddess Ixchel, including Palenque and Isla Mujeres, without realizing at the time why I was drawn to these places. (I visited Palenque three times.) In choosing a name for my website and business, I kept coming back to the oracle card and the name Ixchel. It just resonated on so many levels. After a little research and the realization that many options for names were already taken, I had to be creative in figuring out something unique that would reflect the spirit of my healing practice. The common thread that weaves across the tapestry of my experiences leading up to this moment are Mexico and Ixchel. And so it is. Thank you for visiting! Alternative healing modalities are not a replacement for conventional medical attention and care, but can complement any treatments you are currently undergoing. Never stop any prescribed medication or treatment without first consulting your doctor.